Memories of a massacre 150 years ago, which saw militia butcher 120 settlers, still colour America's view of Mormons. Deep in Southern Utah, amid the salmon-coloured spires and sandstone walls of a strange land, is a valley more soaked in blood, shame and secrecy than perhaps any other in the American West. They call it Mountain Meadow, and it may just figure in next year's presidential election. Mountain Meadow is somewhat difficult to reach. You drive north from St George, uphill. A long winding road. You corkscrew your way up a little side road until you find a vista overlooking a quiet empty valley. And here you have a sign indicating that at least 120 people were murdered in the valley below on a September morning in 1857. Women, children, entire families were slaughtered in what was then the territory of Utah. These West-bound settlers died in a round of executions that took less than five minutes. Believing they were walking into the hands of rescuers in the middle of Indian country, they had disarmed themselves and began to walk single file. And then those same rescuers, most of them members of the Mormon Church, opened fire. Many of the emigrants were shot in the head, at point blank range. Some were hacked to death; others had their throats slit. Those who had remained behind, sick or feeble in the wagon trains, were tracked down and shot in the face or shot in the chest. Next week marks the 150th anniversary of this most contentious and savage epic in the settling of the West. For all the depictions of wagon trains circling to avoid hostile attacks from natives, there was no greater loss of life by west-bound settlers than this shooting of white Americans by fellow white Americans in southern Utah. Yet, until recently, these killings rarely made it into the history books - and if so only as an asterisk. A feature film about the massacre, September Dawn, and starring Jon Voight, opened nationwide last week, to awful reviews. The film is structured as a doomed love story between Mormons and non-Mormons. But it ended up as a muddle and as a clunker. It's likely to fade quickly. Still, interest and discussion of what happened in this slice of high mountain greenery has never seemed more fevered. Mitt Romney, the former governor of Massachusetts, is running for president as a Republican. And while he currently lags in the polls, Romney is well-funded and well-organised, with many political assets. He is rock-jawed and exudes the type of relentless optimism found among corporate leaders who long ago learned how to cheerlead at the drop of a hat. He is also Mormon, and rarely a day goes by on the campaign trail without a question about the "peculiar people", as Mormons sometimes call themselves. When asked if he planned to see the new film, Romney said no - he had no reason to revisit what is likely the most painful history in the Church of Jesus Christ of Latter Day Saints, the formal name for the Mormons. "This was a terrible, awful act carried out by members of my faith," Romney told reporters. "There are bad people in any church, and it's true of members of my church." His church is currently the fastest growing in the United States - with more than 5 million members. They rank 5th among all churches, ahead of Lutherans and ahead of Presbyterians. Their image, of course, is squeaky clean and family-centric. Alcohol, tobacco and coffee are forbidden. Utah, which is more than two-thirds Mormon, has the highest birthrate in the Western world. But when the killings happened in Mountain Meadow, the United States was ready to go to war over this upstart, homegrown church in its midst. And the deaths of 120 people resonate still, in the way we view religion and its sometimes fatal passions. In the 1850s, Utah territory was only nominally part of the United States. In truth, it was a theocracy in the high desert. Brigham Young, who became head of the early Mormons after church founder Joseph Smith was killed by a mob in Illinois, had led his persecuted followers west. Never again, Young vowed, would Mormons be passive in the face of distrust and harassment. He organized a militia, with instructions that they could kill to defend the church colony, and in so doing, they could also kill in the name of God. Visitors were dazzled, and confused. "This was a fairyland to us," said Mark Twain, "a land of enchantment and awful mystery." Twain said Utah Territory was no democracy. "They maintain the semblance of a Republican form of government," he wrote. "But the truth is that Utah is an absolute monarchy and Brigham Young is king." Young was also a grand patriarch, married to more than two dozen wives, ranging in age from 15 to 50. He had a row of large houses in Salt Lake City for his many bedmates, and he often complained about the demands of servicing them. He fathered, according to church records, 56 children. At the time, polygamy was compared to slavery. The president had ordered an army to march west to confront Young. But having faced state militias elsewhere, and lost church members just months earlier in Arkansas, Young was prepared to fight. And it was into this toxic environment that the band of emigrants from Arkansas had travelled. The plan was to kill this wagon train from Arkansas as an act of revenge, though there was scant evidence that these particular people were tied to the earlier persecutions. "Do your duty," Mormon militia leader John Higbee called out on that fateful day. The order from above was that "none who are old enough to talk are to be spared", according to one of the participants. The question has always been, these many years - who gave the order to kill? Mormon leaders at first blamed Indians. Later, they said it was the fault of local leaders - renegades. Brigham Young never okayed the killings, the church said. Twenty years after the massacre, a scapegoat, John Lee, was offered to American prosecutors. He was found guilty and executed at Mountain Meadow. "I have been sacrificed in a cowardly, dastardly manner," he said in his last words. Still, the questions persist. When someone kills in the name of God - who's to blame? The shooters, or the spiritual leaders? And just how subversive was this religion that now seems so homey? The harshest critics of Mormonism compare its base theology to that of the Taliban. How are Brigham Young's followers who murdered children any different than those who lop off heads for Allah? This question is debated in John Krakauer's bestselling book, Under the Banner of Heaven - A Story of Violent Faith. Another, more benign view, can be found in Big Love, the popular cable television show. Big Love depicts a small business owner trying to juggle the demands of three frisky wives in suburban Utah. Their homes look like any other found in the sprawl of the Beehive State. But inside, well, it's domestic turmoil. Most of this is played for light drama and sly comedy. 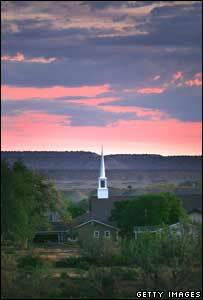 By contrast, there is a compound of real-life polygamists living on the Utah-Arizona border, in the town of Colorado City. It's the world's largest fundamentalist Mormon sect. I've been there several times, and the place is genuinely creepy. Grim-faced young men patrol the compound in pickup trucks and SUVS. Women wear ankle-length dresses and turn their faces away when you try to speak with them. Wives do not belong to their husbands or children to their parents - the church in Colorado city is the ultimate authority. The members of this church say they are the true believers in the faith that Brigham Young brought to Utah. The heretics, in their view, are the five million members of the mainstream church. In the original church, polygamy was a divine revelation. 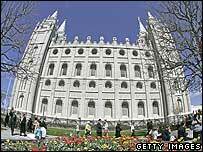 But it was discarded, in the 1890s, as condition for Utah's entry as a state. Let's fast forward now to the presidential election. Most polls show that Americans are willing to elect a black man, a woman or even a three-times married man as their next president. But a Mormon is problematic, especially among Christian conservatives, who view the mainstream church as a sect. I've always been fascinated by Mormons. The audacity of their social experiments, alone, is compelling stuff. But as the church continues to add members at a furious pace, boosted by an army of 50,000 missionaries, and as the first serious Mormon presidential candidate moves to stake his claim to history, there remain these clumps of treacherous history yet to be ironed out. The biggest one is at Mountain Meadow. It's a quiet place that still holds far too many secrets.